A flush cup is a good alternative to the common sling swivel stud. It retains the look and feel of expensive wooden stocks. 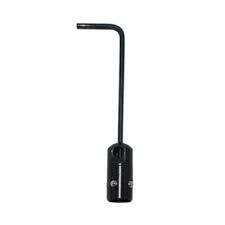 To use a flush cup wit the NoePod standard adapter you need our sling stud adapter, SKU010. It comes with an extra high, 4mm, pad. It installs without tools. Just use the supplied allen key to depress the plunger and you’re ready to mount the adapter. There are two major suppliers of push button bases. Recknagel is commonly used on European premium guns. The flush cups start with part number 23000- and you find them on page 16 in the Recknagel Gun Accessories catalogue. The American supplier is Grovtec.